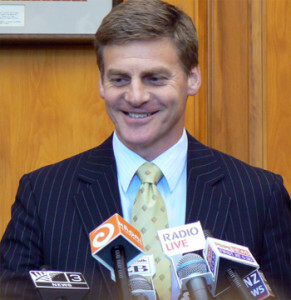 Deputy Prime Minister Bill English is pleased to have New Zealand’s House of Representatives all to himself this week as Prime Minister John Key embarks on an overseas trip to China. English, who is currently Acting Prime Minister in Key’s absence, has held more than six press conferences in the last two days, including several at early hours of the morning. English has been eager to answer questions on everything from the Rio Tinto debacle to the GCSB controversy. “Does anyone want to ask me about my relationship with Ian Fletcher?” asked English at a hastily arranged press conference this morning. “Do you have one?” asked a tired One News Political Editor Corin Dann. The Deputy Prime Minister has also made numerous trips to schools around Wellington today, including a visit to Newlands College, where Principal Grant Jones introduced him as “New Zealand’s Finance Minister.” English was quick to point out that, actually, he was “technically pretty much the Prime Minister” today. English told a group of year nine students at the school that it was “fun” being Prime Minister and that he was looking forward to taking questions on John Key’s behalf in Parliament tomorrow. The Acting Prime Minister has several more press conferences scheduled for this evening, though whether they will go ahead is in doubt after his last one – held just under an hour ago – was attended by just two journalists. It is presently unclear whether even Bill English will show up tonight. When last seen, he was busy moving several large boxes into the Prime Minister’s office.